The modern style home with designer looks, crisp edges and sheer surfaces is a very appealing and sought after commodity for home owners and investor alike yet, as with every style and age of house construction there are pitfalls in design and product use. ‘Blue Board’ has been used extensively as an external base cladding material in residential homes, alterations and additions, where the lightweight system with its monolithic rendered look creates a cost-efficient installation combined with a highly-desired appearance. Ideal for full wrap or composite construction designs on either timber or light gauge steel framed homes the product has been a mainstay with high usage on homes with installations utilised in combination masonry and light weight framed upper storeys and outer decorative features including fences, walls and beams etc. Manufactured by James Hardie for more than 20 years, HardieTex blue board base sheet is the ‘original’ blue board fibre cement cladding designed for the application of a third party specialised 2mm thick acrylic texture coating. HardieTex blue board base sheet is resistant to damage from termites, rot and fire. Whilst the product may be resistant to the previously mentioned, all structures within the built environment are subject to weather extremes and soil movement. Building designers and architects assess numerous conditions when creating the structural requirements for all new dwellings. Some of the inclusions are topographic, wind design, shielding factors and importantly, specific structural inclusions which require formal assessment and calculations by structural Engineers who provide reports and instructions to be utilised within the specific construction. As product manufacturers continually research and develop new materials for the construction market, each variation often includes new or evolved methods of fixing and integration into the construction process. Timber framed homes or the sections of homes built with framing and ‘blue board’ cladding are very susceptible to movement faults. Even the best installation – following the manufacturers specifications to the letter and abiding to any engineering requirements may result in a failure or partial defect taking many years to become apparent. Extreme weather conditions including prolonged drought and flood can wreak havoc on buildings as stress and strains create weaknesses and expose fallibilities. Seemingly subtle incursions of water via cracking and seam failures in texture coated Blue board cladding into framed constructions creates absorption of moisture resulting in timber rot, rusting of steel components and dependent upon the location and purpose of the specific member(s) major far reaching failures. 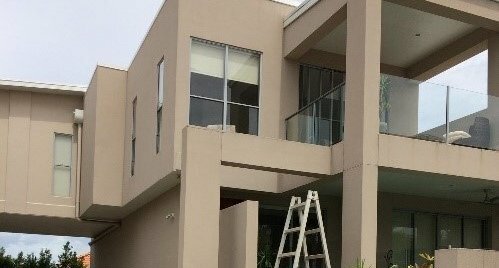 The creation of tiled balconies over living rooms is a major area for such failures as waterproofing membranes are tested to and beyond their capacities. I strongly recommend annual inspections of buildings with a view toward preventative maintenance as the best way to arrest preventable situations prior to the need for potentially serious remedial works. Noel Page is a licensed Builder and registered Real Estate Agent. He currently works as the Sales / Business Development Manager for Your Asset Group on the Sunshine Coast, Queensland.